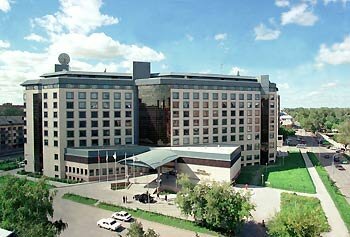 The Tyumen Hotel is a modern business four-star hotel of international standard ideally located in the very heart of the city, close to all main business and government offices, banks, shopping malls and historical monuments. The hotel offers comfortable accommodation, competent realization of business meetings and well-equipped rest. There are 230 rooms of international standard, including cosy Single and Double Rooms, comfortable Studios, Suites and Business Suites with spacious living-rooms and working area, and a luxury Presidential Suite. All rooms are fully equipped with exclusive facilities including satellite television, air-conditioning, direct telephone line, a minibar, and a bathroom with a hair-dryer, cosmetics and bath accessories. The following services are included into the accommodation price: buffet breakfast, mail delivery, porter service, taxi call, safes at reception, medical service, visiting the hotel gym. At the cafe, bars and restaurant of the Tyumen Hotel guests can enjoy the finest cuisine and a great choice of desserts and drinks. The Four Seasons restaurant (150 seats) is located on the second floor of the hotel. This place is good both for wedding parties and festive events, and for business dinners and romantic suppers. A wide assortment of Russian and European meals and a fine choice of wines can meet demands of the most exigent guests. The Vienna cafe (80 seats) represents a diverse choice of gourmet eating - delicious breakfast, elaborate lunch and dinner inspired by international and traditional Russian cuisine, exclusive desserts and cakes made at the hotel's own confectionery by special recipes. The multifunctional banquet halls can offer various versions of arrangement and may be used for holding business and cultural events. The Manhattan night club offers a special atmosphere, professional lighting, and exclusive cocktails. The hotel's conference centre offers one large conference hall and five smaller ones that can accommodate up to 250 people. The halls are equipped with advanced novelties, such as simultaneous translation system, audio and video equipment, overhead projector and multimedia projectors, microphones. At the hotel's business centre a comfortable separate office and all necessary equipment are available: computers, printer, fax, scanner, copying machine, Internet, e-mail, binder and laminator. At the hotel's fitness centre guests can visit a sauna, a swimming pool, a massage room, a bar, a Turkish bath, jacuzzi, a gym, a solarium. Every guest here is given a towel, a gown, slippers, an individual locker for personal things and a deposit safe for valuables. Other services of the hotel include: laundry and dry-cleaning, safes at reception, a parking lot, a beauty parlour, a souvenir shop, mobile payment terminal.